What is the ratio of intensities of two sounds of identical frequency if the first is just barely discernible as louder to a person than the second? This is College Physics Answers with Shaun Dychko. We're told in section 17.6 that the minimum discernible sound level difference is one decibel. And so, we're going to take beta two minus beta one to be one decibel. So, we know what the difference in sound levels should be. But the question is asking us for the ratio of intensities. So, we should create a formula for giving us intensity in term of sound level, and then we'll divide the two intensities and then figure out the ratio. 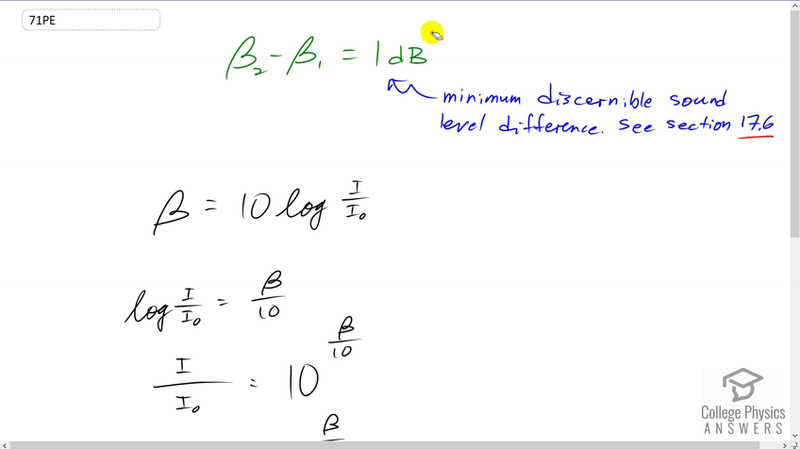 So, in general, sound level is ten times logarithm of intensity over reference intensity. And, we'll divide both sides by ten, and bring the unknown to the left. So, we have logarithm I over I naught equals beta over ten. And then, make both sides exponents of ten. And then, on the left side, we're left with the argument of the logarithm, because it's the base ten logarithm. And so, that's I over i naught. And on the right side, we have ten to the power of beta over ten. And then, we multiply both sides by I naught to get I. So, the intensity is I naught ten to the power of beta over ten. So now, we have a function for intensity in terms of intensity sound level or sound intensity level, I guess is what you say. So, let's divide these two intensities now, intensity two divided by intensity one is going to be I naught beta two over ten. So, substituting this in place of I two. And then, I one, we have I naught ten to the power of beta one over ten. Now, the I naughts will cancel, and we're dividing two powers of the same base, and so we can rewrite is as the base to the exponent, which is the difference in these exponents. And so, we subtract them, and beta two or ten minus beta one over ten is beta two minus beta one all over ten, since there's a common denominator. And, in this particular question, we know that beta two minus beta one is one. And so, we write that here, and so the ratio of intensities then is ten to the power of a tenth, and that is 1.3. So, the second intensity is 1.3 times that of the first in order to have a minimum discernible loudness.